Yang Kee Noodle offers service that feels classy for the mall atmosphere – and that’s not a bad thing. Servers bring your meal and cutlery right to your table after you order at the counter. And no worries if you’re too tired to throw your trash away – employees clear your table, too. These little things might not seem like a big deal, but it tickled me pink to spend less than $10 and get a sit-down restaurant experience. Other national fast-casual restaurants with similar price points such as Panera and Chipotle don’t even give this type of service. 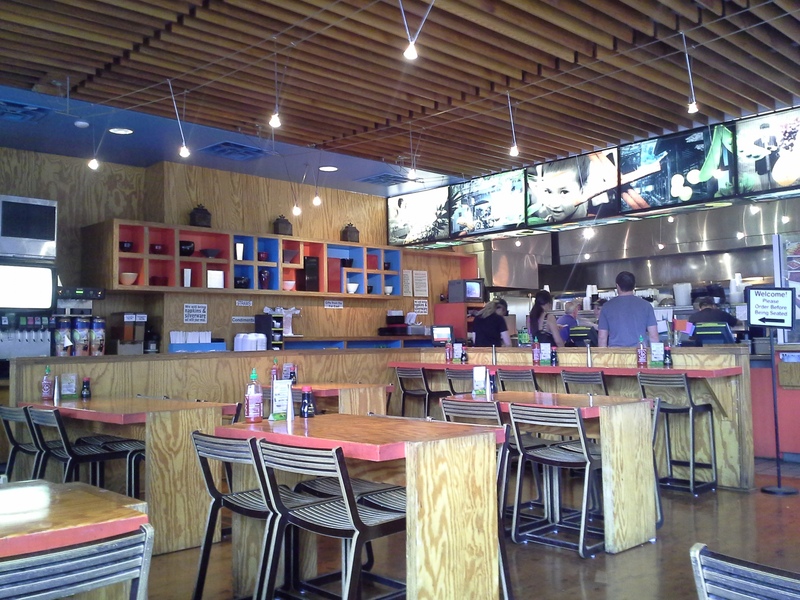 Yang Kee Noodle dining room. Yang Kee Noodle delivers a lineup of food that focuses on Asian-American cuisine that’s approachable to a large audience. I’ve seen Yang Kee Noodle’s menu items offered at a number of local Chinese places, such as fried rice ($6.99-$8.49), General Tso’s ($7.99-$8.99) and egg drop soup ($2.79). But this restaurant’s dishes are lighter than the more greasy fare I’ve eaten at other places. 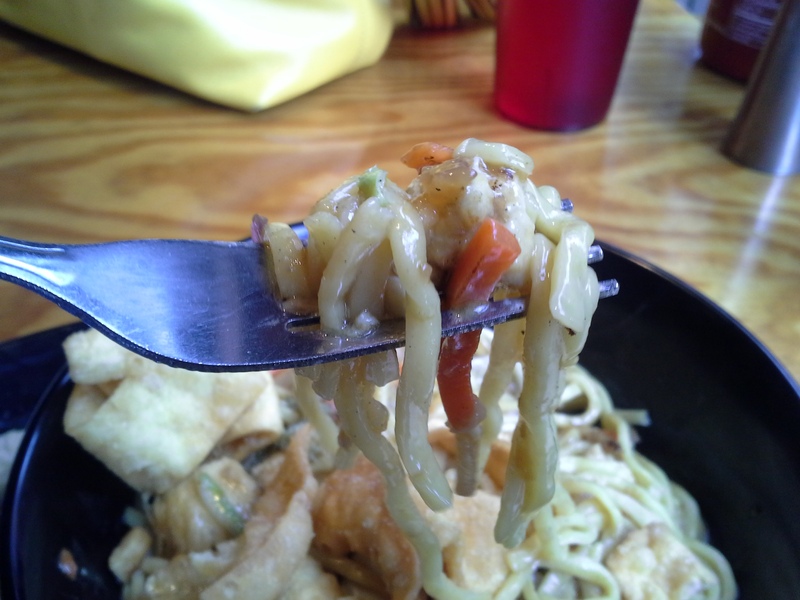 The noodles of the chicken lo mein, for example, left me pleasantly full instead of roll-me-out-the-door bloated. Yang Kee Noodle’s chicken lo mein. The number of options that Yang Kee Noodle offers its diners also sets the restaurant apart from other eateries that serve Asian food. The variety of combo options, stir-fry customizations, and a “pick two” menu provides opportunities to sample from across the menu in just one visit. Customers can upgrade any entrée to one of four combos, such as adding an egg roll and soft drink for an additional $2.59 or a cup of soup and a soft drink for $3.29. For stir-fry dishes (starting at $7.49), patrons choose the meat (or tofu) of their choice, a set of vegetables and sauce such as the Honey Bourbon or Golden Ginger, and rice or noodles. And the “pick two” menu ($7.49 or $8.99 with a drink) lets you chose from six starters and five entrees for one filling meal. 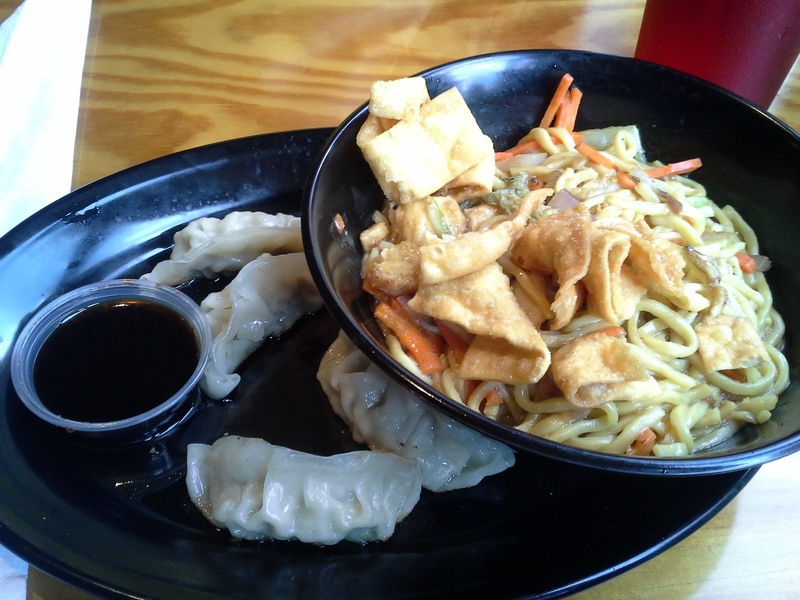 During a recent visit to Oxmoor, I stopped by Yang Kee Noodle for a pick-two lunch of chicken lo mein and potstickers. I also sprung for a soft drink ($8.99 for the meal). Everything is made to order, so I waited about seven minutes or so for my lunch. The food was piping hot when a server brought it to my table beside the window. 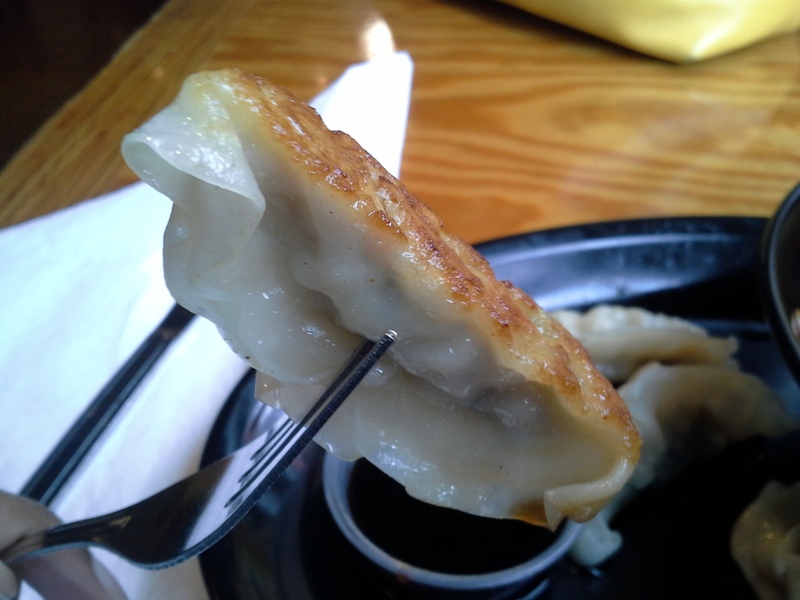 I started with my four potstickers, slim pockets of chicken and pork served with a Singapore sauce on the side. This was a slightly salty yet light appetizer that provided a nice balance to the relatively sweeter lo mein. Nothing fancy, but nothing terrible, either. The lo mein was loaded with shreds of carrots and strips of chicken. I could’ve gone for more cabbage, but that’s more of a personal preference. As I mentioned earlier, this noodle dish is much better than its counterparts at fast Chinese food restaurant because of its lighter sauce and fresher taste. A soy sauce coated the noodles well and didn’t leave the dreaded pool of gelatin-like substance at the bottom of the bowl. The flavors are pronounced enough to be interesting but subtle enough for a wide appeal. And those fried wontons on top? Yes, please, more of this. Like my general relationship with shopping malls, I’m afraid that Yang Kee Noodle’s location in Oxmoor Mall is a gift and a curse. The restaurant provides a healthy, local dining option in a shopping center that just got rid of its food court, but I’d bet money that most people don’t think about going to the mall just for a meal. 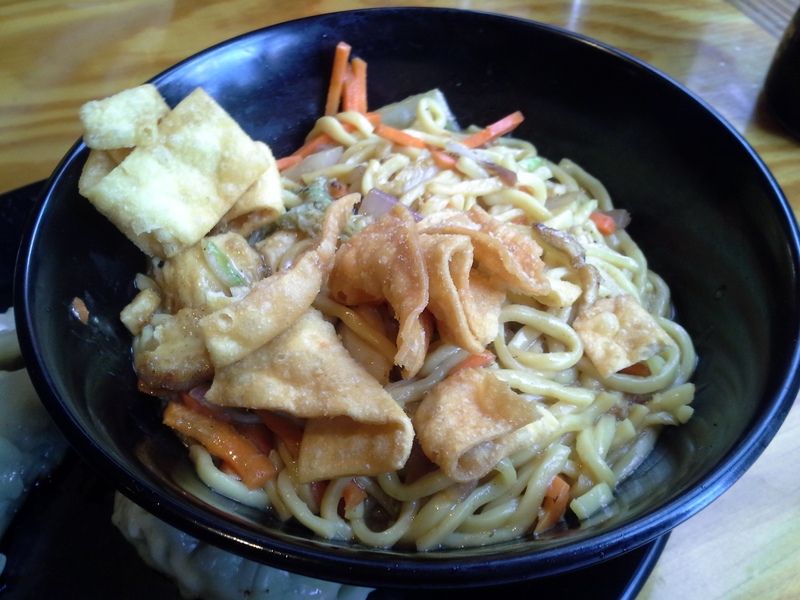 But Yang Kee Noodle is a hidden gem in the Louisville dining landscape. It’s affordable and it’s good. It’s even worth a trip to the mall. Rob once brought home some Firecracker Chicken and Yin-Yang Hot-Sour soup ($11.28 for the combo) when my head was congested. WHOA. Not only did both these dishes clear the heck out of my nasal passages, but I also sweated during the entire meal. Bonus: there was enough Firecracker Chicken for lunch the next day. There’s a nice outside patio for dining al fresco. Yang Kee Noodle also serves beer. Put two and two together, and you get a nice place to spend a summer Saturday. Decide what you want to order before you hit the cash register. 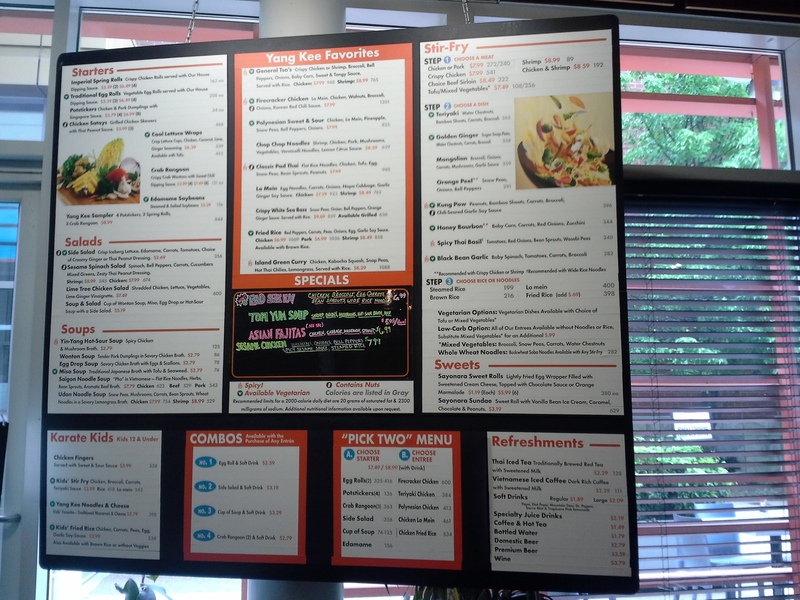 A bit menu board and to-go menus are positioned near the entrance for pre-meal planning. Yang Kee Noodle menu board. Yang Kee Noodle, 7900 Shelbyville Road, Louisville, Ky. I didn’t know that place was local. I thought it was a chain. I learn so much from you everyday. That seems to be the overwhelming misconception. It’s local, y’all! Yang Kee Noodle is one of my favorite restaurants in Louisville PERIOD! My favorite is the Firecracker Chicken which you talked about in your post and I rave about how consistently good it is each and every time. I am a big guy and the portion is perfect for me and I never feel “blah” when I leave “The Noodle”. They are opening a 2nd location from what I hear and I wish them nothing but great success! That Firecracker Chicken should come with a warning label! For me, the walnuts really make it. I love (and miss) this place! It took me a long time to try it, but then I was hooked! I’m coming back to town for a visit in a few weeks, I’m starting to put my list of restaurants to go to!! !